Yoga is often considered a great, low-impact form of exercise for people who suffer from chronic conditions like carpal tunnel syndrome. However, yoga can sometimes be too intense, especially in classes that emphasize arm balances that put a lot of pressure on the hands and wrists. In order to avoid making your condition worse during your yoga class, read on to learn which poses people with carpal tunnel syndrome should do on a regular basis and which ones they should avoid. Add more of these poses into your yoga practice, especially at the beginning when your body is still warming up. This pose allows you to gently stretch the wrists and forearms while also warming up the spine. To do this pose, start by kneeling on the ground with your wrists under your shoulders and knees under your hips. Pull your abs in toward and keep your back straight. Then, inhale and drop your stomach toward the ground while looking toward the ceiling. As you exhale, tuck your chin and tailbone and round your spine so it forms a “C” shape. Hold this post the stretch your wrists. If class ever gets too intense, you can do this pose while sitting or standing to take a break and catch your breath. Simply bring your hands together with your thumbs touching your sternum. Make sure the heels of the hands touch to stretch the wrists. You can also lift your elbows to deepen the stretch a bit more. This is a good counter-stretch for cat-cow and prayer pose since your wrists are turned in the opposite direction. Start in a standing position. Separate your feet so they are hip-distance or a little wider. Then, bend from the hips and reach your hands toward the floor. You can bend the knees as much as you need. Lift the toes and place your hands under the feet with your palms facing up. Your toes should be close to the creases of your wrists. To deepen the stretch, lean forward a bit on the balls of the feet. This is a more advanced pose, but it’s helpful for stretching the wrists and forearms. Start by sitting with your knees bent and the right knee stacked on top of the left. Reach your left arm up toward the ceiling, then bend the elbow and reach the left hand toward your upper back. Reach behind you with your right arm and try to clasp your hands together. If your hands can’t touch, use a yoga strap to make the pose easier. The following poses are typically more difficult for people with carpal tunnel syndrome. Use caution when practicing any of them and don’t be afraid to modify with blocks or a wall and take a variation that will put less pressure on your hands. Depending on the severity of your condition, you may not need to skip all of these poses. Some, like downward-facing dog and plank, may be fine as long as you’ve warmed up your wrists and hands properly. Listen to your body and back off if you feel any pain. Trying to stay active while dealing with carpal tunnel syndrome can be frustrating. 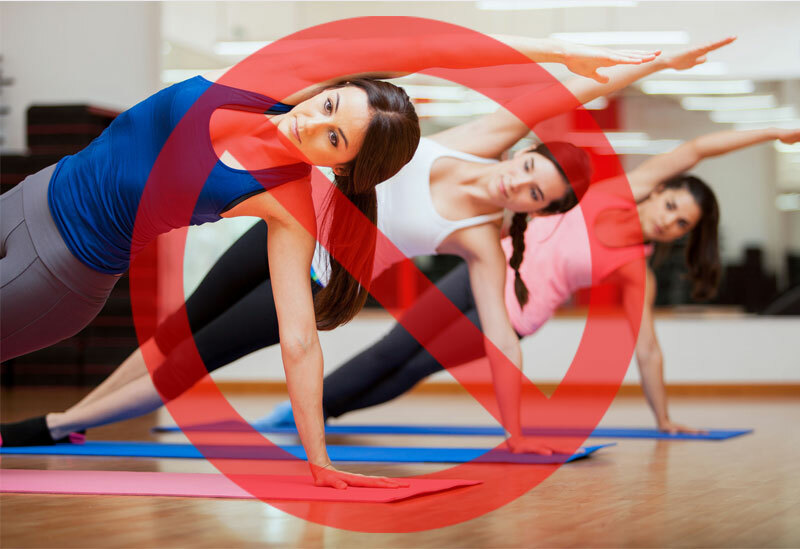 But, if you keep these tips in mind and avoid yoga poses and exercises that aggravate the wrists and hands, there’s no reason why you can’t continue doing what you love!